A week in the Atacama Desert, South America! Note: This article was originally published in "Eco-Link" - an in-house electronic newsletter for employees of the Washington State Department of Ecology. 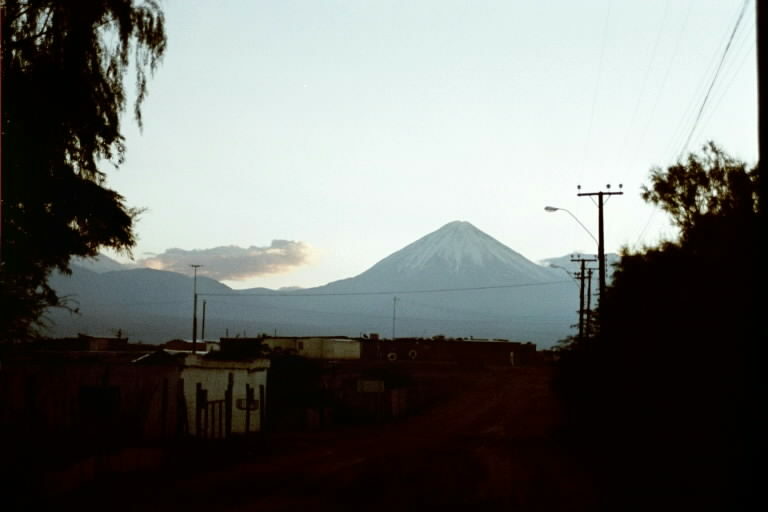 I was in South America for a month again in the northern hemisphere winter of 2001- summer there. It was my third trip there, and it's starting to appear that I am making a "serial trip" up the west coast of South America. My first trip, four years ago, I was in the far south (in parts of Chile and Argentina). Two years ago I was in the middle south (same two countries). This trip, I went north from central Chile to parts of Bolivia and Peru. 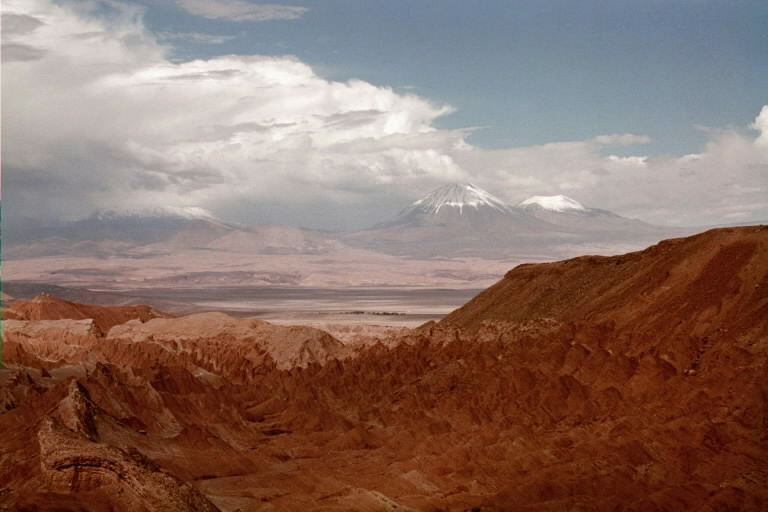 While some of the high points for me were also the literal high points (in the Andes Mountains of Bolivia and Peru), I thought I'd write about some time, about a week, spent in the Atacama desert, the world's driest region. I began the trip by flying to Santiago, Chile. I traveled mostly by bus, though late in the trip boats and trains came into play, and once I took a colectivo (shared taxi) for a couple hundred kilometers. After a few days in the cities of Santiago, Valparaíso, and La Serena, I entered the Atacama proper at the city of Copaipó. Leaving town by bus in the morning I was watching the plant life closely, thinking it was nearly barren. Soon I realized I'd ridden fifteen kilometers or so without a plant in sight. I figured I could come home and be able to say I'd seen areas where not a plant grew. A couple hundred kilometers later I still was looking for the first plants, and realized that was the norm in the Atacama, not something that you'd see here and there! The Atacama covers most of the northern part of Chile, and in reality continues north up the coast of Perú for hundreds of miles. In Chile it extends far into the mountains. Below about 3,000 meters, plant life of any kind is usually limited to a few areas of oasis. I say usually, because when rare chubascos (thunderstorms) drop rain in limited areas, long dormant seeds sprout and the desert may be carpeted with flowers for a few weeks. They soon disappear and may not be seen again for a century. Another spot where plants may be scattered is at the base of rocky coastal canyons where the incessant morning fogs may condense enough to support a very few burnt-looking little herbs. The desert rains may produce some great rainbows, too, as I found when I was brushed by chubascos near San Pedro. Most areas you see are vegetation-free, however, quite a contrast to the temperate rain forests of the southern parts of Chile, where plants may be growing in such profusion that it's impossible to get through them. 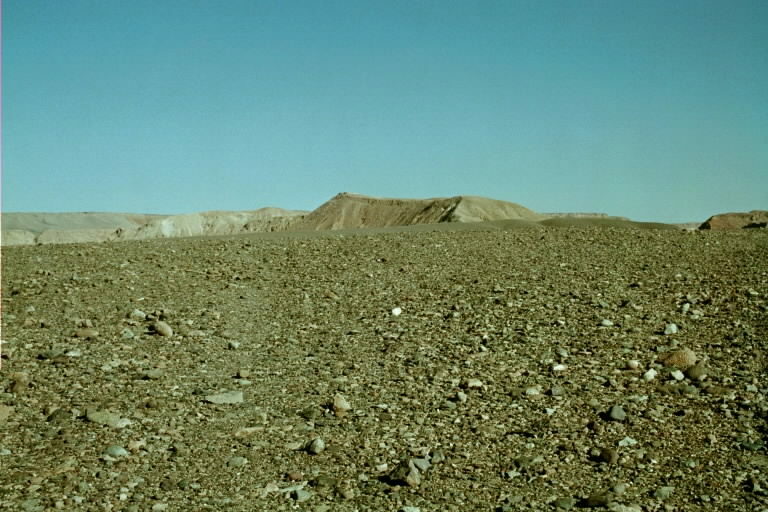 A typical slope in the Atacama might appear like a gravel pit or mine tailings at first glance, though there is lots of variety too. Sometimes soluble materials forming the bedrock are slowly eroded into fantastic shapes by the rare rains - it must take eons! 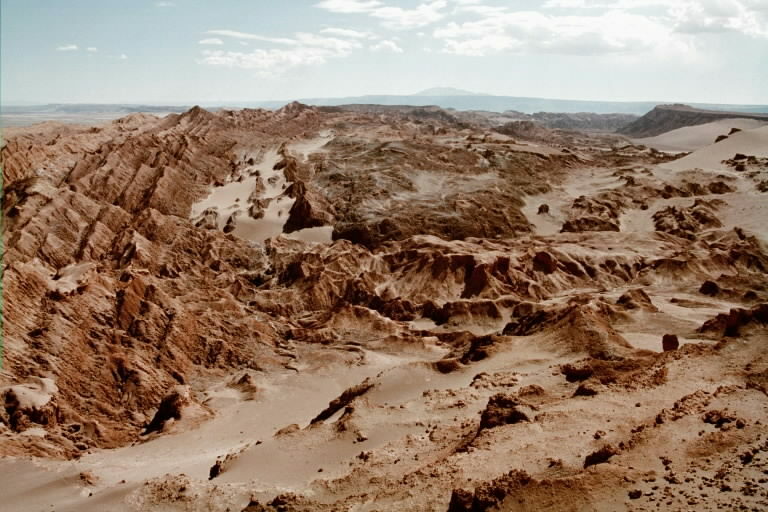 On the Atacama coast there are scattered cities, depending on water piped dozens of miles from streams that descend from the high mountains. I visited several, and each was similar in that they end abruptly where the dusty, hot, oddly humid urban area meets the stark desert barrier of the coastal mountains. None of these coastal towns looked hospitable to me, though several include large glitzy resort areas where Chileans come north to play. 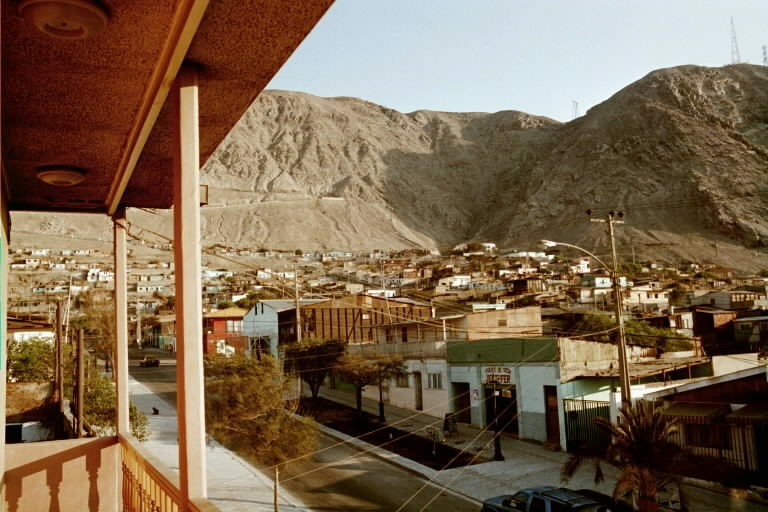 In the large city of Iquique, what the locals claim is the world's tallest dune dwarfs the high-rises and condos of the beach resort and appears to be swallowing parts of the city. 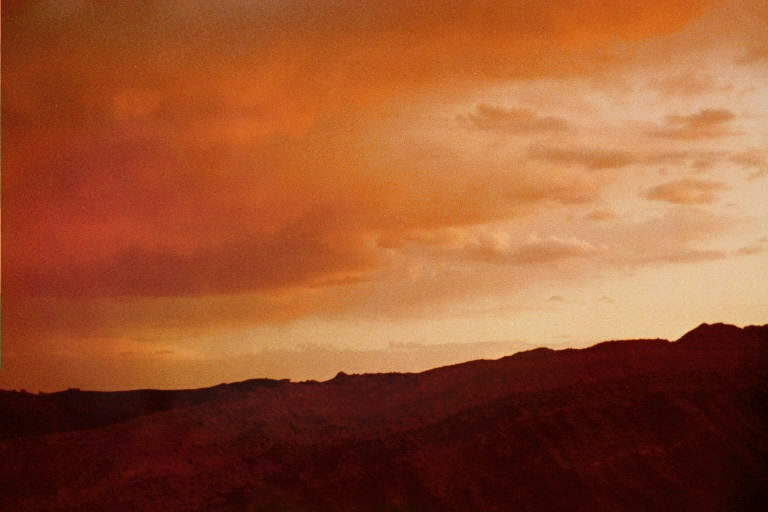 All through the Atacama, there are wonderful sunsets! 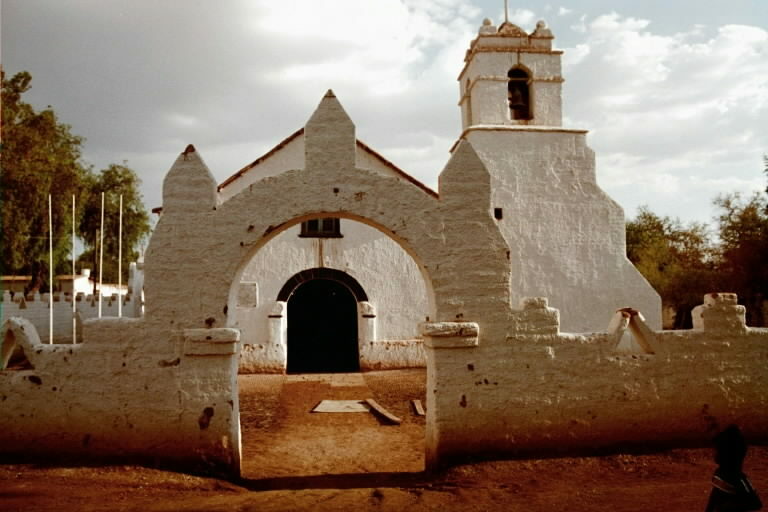 The village of San Pedro de la Atacama was the best part of the visit to the Atacama for me, as it is for many travelers. This is an old mountain town, also called "El Oasis," at 2,500 meters near the Bolivian border. Though full of tourists, it is worth a visit to see the stark, colorful landscapes (reminiscent of Death Valley, CA), the high volcanoes (some over 6,000 meters), the quaint old adobe town itself (including a 17th century church), and the surprisingly good museum of archeology built by a Belgian priest in the mid twentieth century. 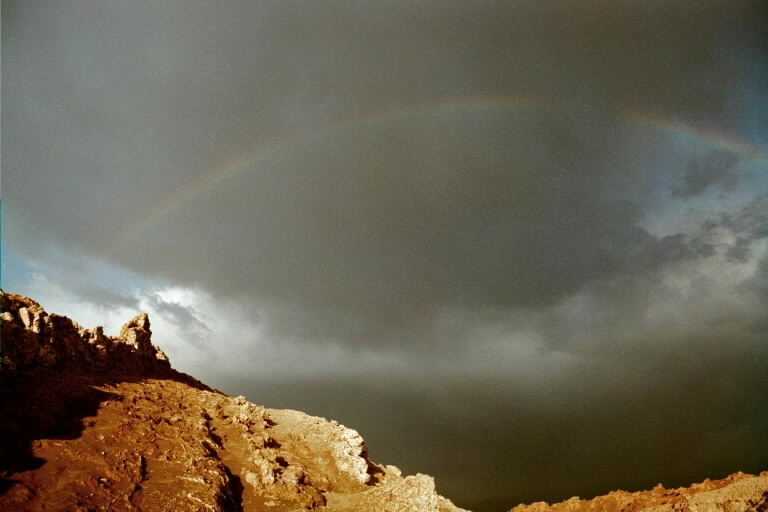 The San Pedro area is extremely scenic, and one may choose from a variety of tours, including a geyser field, salt lakes, volcanoes, remote villages, several-day off-road caravans to the Bolivian salar country, or trips to the desert valleys nearer town. 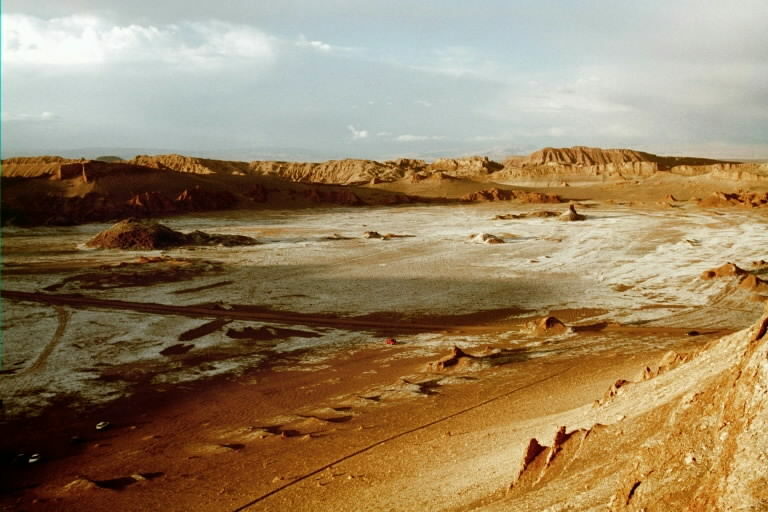 A popular half-day trip is to the areas they call "Valle de Muerte" (Death Valley) and Valle de la Luna (Moon Valley). Some of my best photos of the trip, in my opinion, came in these areas. The tour ended with a spectacular sunset viewed from the top of a peak composed of good old table salt! 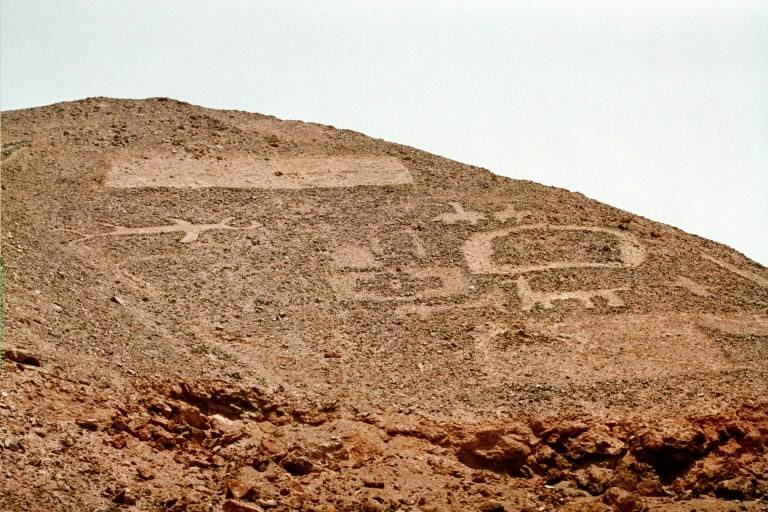 Another great sight in the desert was giant geoglyphs - hundreds of pictures made on the actual surface of the ground - at Pintados. 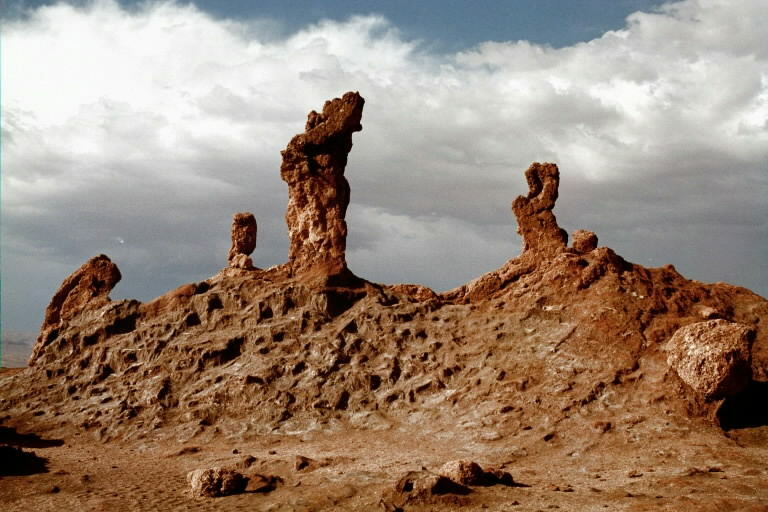 These relics, probably thousands of years old, are a national park and protected. You can't get too close so they are hard to photograph, but the light was pretty good when I was there and I think I got some decent shots. 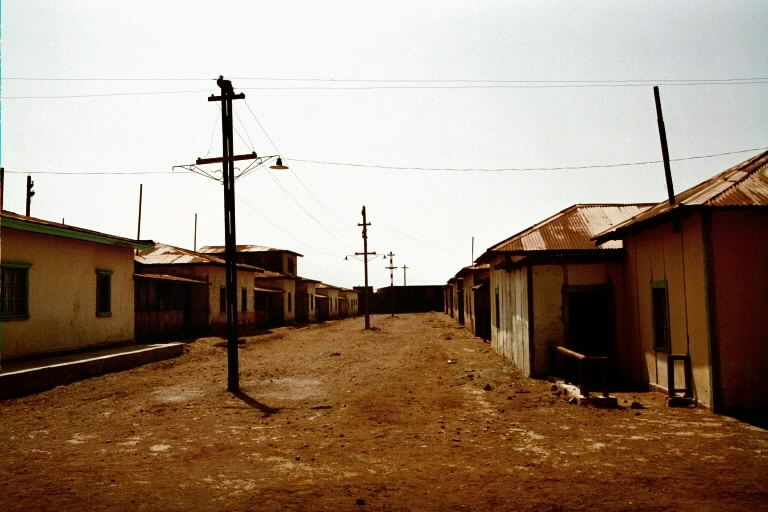 Nearby are several mining ghost towns, including Humberstone, looking almost as if you could move back in today, though it has been abandoned over 50 years. The rest of the trip? Well, wow! It included many ruins (Tiwanaku and Isla del Sol in Bolivia, numerous ruins in or near Cusco, Machu Picchu), Lake Titicaca, the Urubamba River, a 4,660 meter pass, interesting and odd foods such as alpaca steak and cuy (guinea pig), and lots of other great experiences. I could go on and on, but if you want to see those pictures feel free check out this page with links to the rest of this trip as well as other trips.